Poinsettias are the ultimate Christmas flower, and now that we have our line of holiday floristic crepe, we couldn’t wait to show off our new design for crepe paper poinsettias. This is our first crepe poinsettia, so we had to make it a good one! Poinsettias generally come in white and red, which fits perfectly with our holiday color palette. We used 6 out of our 10 new floristic colors to bring these crepe poinsettias to life, but you can really use any of the colors in the 10 pack. We especially love the floristic for crepe paper poinsettias because the deep veins give it the gorgeous thick texture that you see in real poinsettias. In our photos you can see the colors Snowflake, Egg Nog, Peppermint, Holly Berry, Bordeaux and Pistachio. 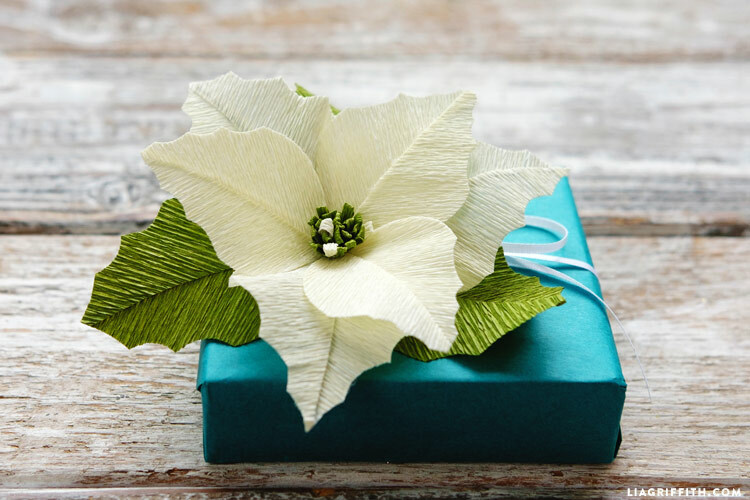 You can use the other two shades of green (Spearmint and Pine) to create some variation in the leaves of your crepe paper poinsettias, and who can resist a silver or gold poinsettia for metallic holiday decor. Find our floristic 10 pack and browse all of our papers in our shop. Each poinsettia petal is made up of two pieces glued together and attached to 20 gauge floral wire. Our crepe paper poinsettias are the first Christmas project that we are adding to our Craft School video collection. You can find the full materials list and video tutorial here! We would consider this an intermediate level project, but we absolutely encourage you to try it out even if you are a beginner. 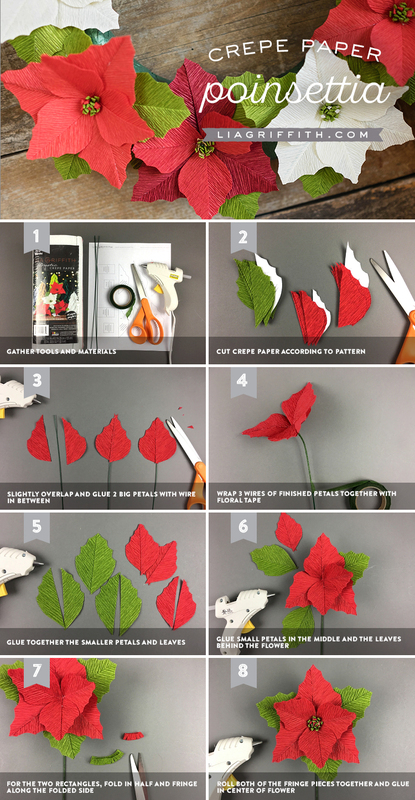 Unlike other crepe paper flowers, you won’t have to stretch the paper at all for this project. 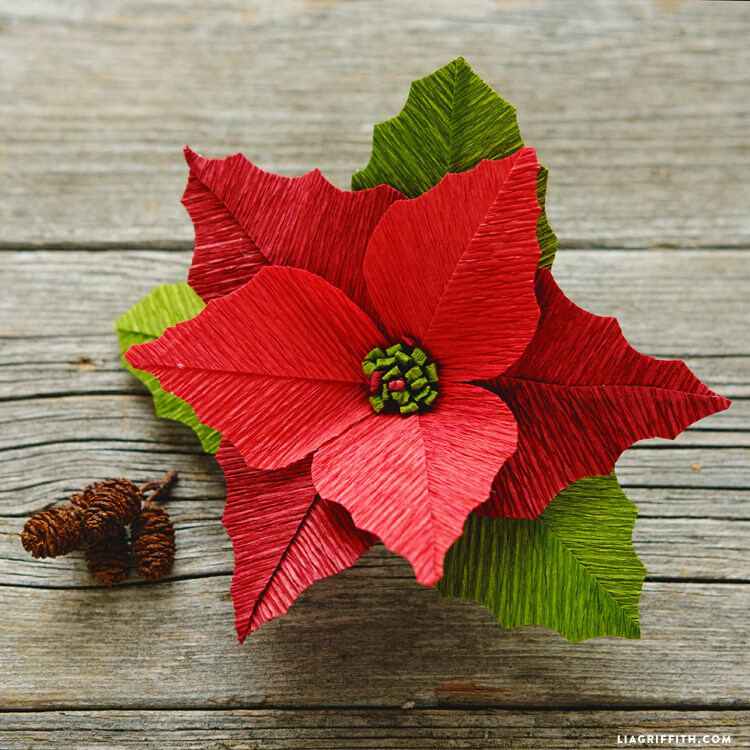 Watch our crepe paper poinsettia video tutorial here! I love this flower also.i William try IT this weekend. so so jumping for joy i cut my first crape paper with my cricut maker……i made a poinsettia…. How exciting!! We love our Maker too, can’t wait to see what you make with yours next! is the svg for the poinsettia coming out soon? These papers look sooo beautiful .Are they available in India ? Thank you! Unfortunately we are only able to sell in the US and UK but hope to one day expand worldwide! Hi Lia! Is the hot glue necessary for these beautiful crepe paper flowers? If not, do you have any recommendations as to what kind of glue/adhesive would work as well? I’m just a klutz when using hot glue guns ? Thank you in advance! Are any of your paper packs/craft packs available in the UK? Not yet 🙁 We are doing everything we can to have the paper available outside the US! Lia– I’m loving the new crepe! The new paper colors are beautiful! These points’ really pop with the vibrant colours your crepe paper brings to the game! Stunning! Hope I win some, as it’s not available here in Canada! Thanks Laura! Someday it will be available in Canada! What gauge wire is used for this poinsettia project?? 18 or 20 gauge works great!